No, not breaking news. In fact this news is exactly 17 years old today. It's gearing up to its AS's, it's got a deep voice and it needs to shave more than it used to. Sensing the historicity, I kept the newspaper for that day. All it tells me 17 years later is that it was otherwise a pretty slow news day and that evening was televisually dead on all four channels. 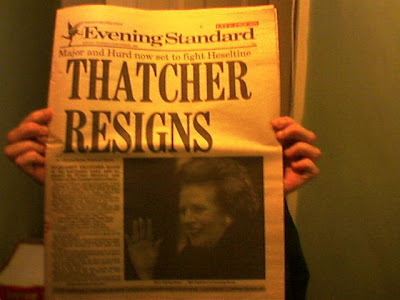 Thatcher's horoscope for that day, according to the Standard (she's a Libra): "Although you may not wish to read any more warnings about travel plans or long-standing arrangements, complex planetary influences over the next week or so signify it is time to confront and challenge those who have either taken your support and enthusiasm for granted - or worse, tried to outsmart you." It was our generation's Kennedy moment – you always know where you were when you heard. In my case, I was standing by the desk that held the stationery and the electric typewriter, when Piers From The Office Downstairs popped in and said, "have you heard?" Seeing Thatch leave Number 10, lip almost a-quiver, was one of the two times I could almost – and I cannot overstress the tenuosity of that almost – feel sorry for her. But she was by this point clinically insane and she had brought it on herself, so I let it pass. The other time was in her infamous Belgrano interview. For those of tender years, she was on a radio phone-in programme – or was it TV? Anyway, she was answering questions from the public. One worthy took her to task for the sinking of the Belgrano, on which the one thing everyone could agree was it had been outside the exclusion zone of the Falklands and heading away from Our Boys when the torpedoes hit. What Thatcher should have said was something like this. "Yes, the Belgrano was heading away from the combat area. However, we had cause via Naval Intelligence to believe that in common with many modern ships it was fitted with a device known as a ..." [Here she could have twitched her fingers in the air to suggest inverted commas, Dr Evil style] "... 'rudder', which could conceivably enable it to ..." [Another twitch] "... 'turn round'. This would have meant it posed a potential and legitimate threat anywhere within a circle defined by the Belgrano's position as its centre point and the Belgrano's fuel supply as the radius. Therefore we sunk it. So STFU, noob." Should have, but didn't. Again, it was her choice, so sympathy was not actually that high.